The colors and the Monster High graphics make the bike distinctive. Front wheel spokes decorated with the beads. 3-brakes system for stopping power. Reflector on the pedals for the safety. Adjustable and removable training wheels. No kickstand if you remove the training wheels. The brakes, pedals, and wheels may need extra inspection and fine-tuning. 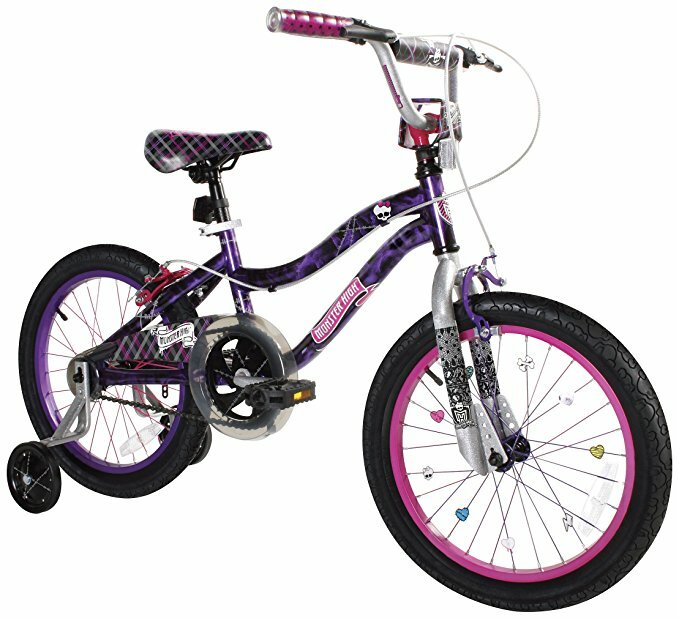 This is the summary of consumer reviews for Dynacraft Monster High Girls BMX Street/Dirt Bike 18", Black/Purple/Pink. The BoolPool rating for this product is Good, with 3.90 stars, and the price range is $83.80-$109.99. 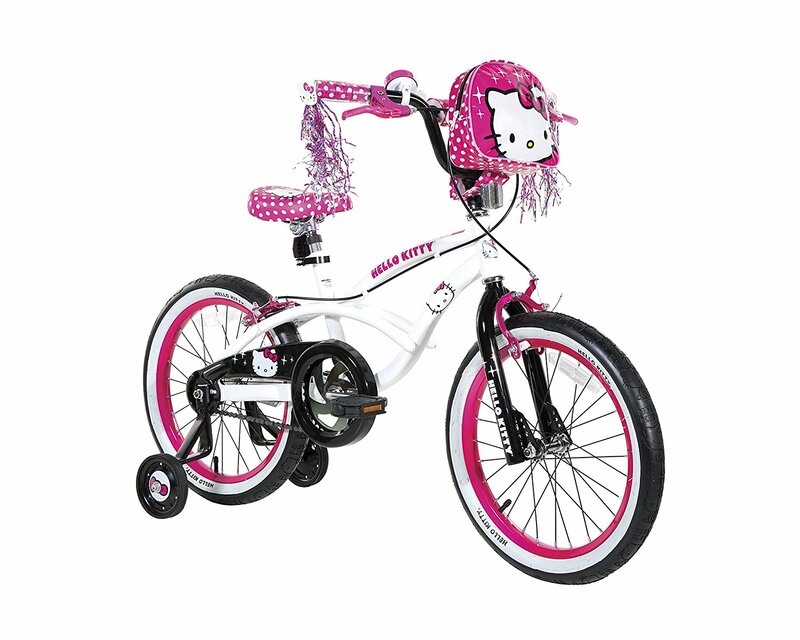 The kids will love to ride around with style on the Dynacraft Monster High Girls BMX Street/Dirt Bike. 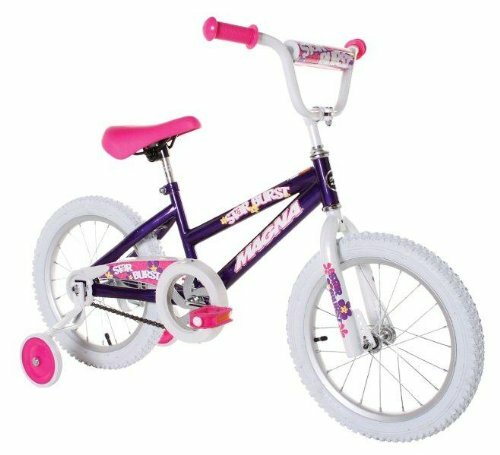 The color black/pink/purple/silver, the Monster High graphics, and the decorative front wheel adorned with skull and heart beads make it distinctive from the other girl's bike. 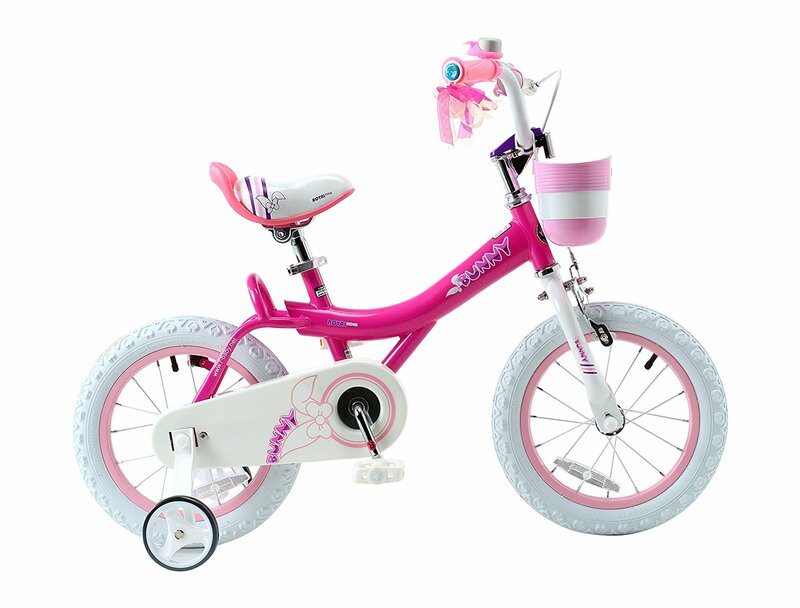 It features pedals with reflectors for safety, adjustable/removable training wheels for extra stability, an alloy quick-release set for a comfortable riding experience, black knobby tires to provide a smooth ride on flat terrain, and the coaster brakes along with a front and rear caliper to ensure smooth stopping. 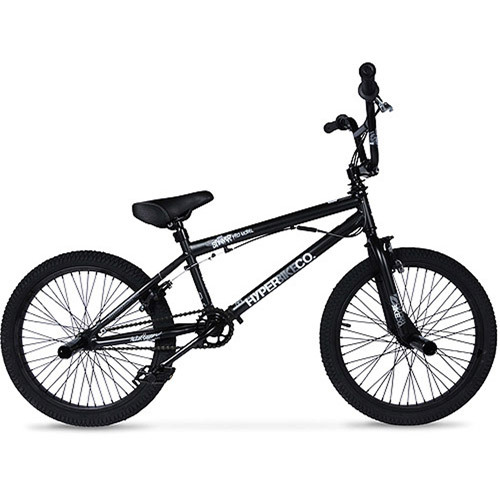 Other features include BMX steel frame with sleek paint finish, adjustable padded saddle, and handlebar/crossbar pad. This bike gives a lifetime warranty on the frame and fork. 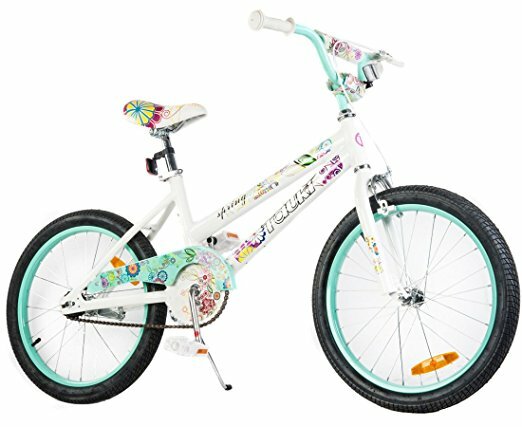 Users love Dynacraft Monster High Girls BMX Street/Dirt Bike for its price and unique look. It is sturdy, well made, and easy to assemble as most of the parts are preassembled. Kids are obsessed with this bike. However, Dynacraft Monster High Girls BMX Street/Dirt Bike does not have a kickstand if you remove the training wheels. A few, suggested to check the parts of the bike such as the brakes may need fine-tuning, the pedals may not fit, and the parts of the wheel may be bent. 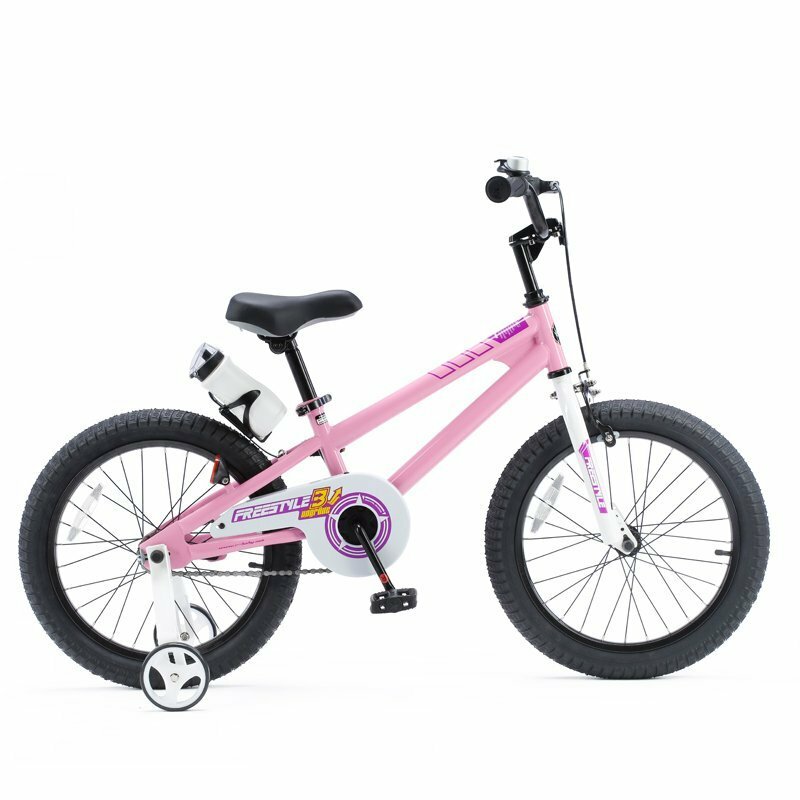 Overall, Dynacraft Monster High Girls BMX Street/Dirt Bike is a reasonably good quality bike that will appeal to those who dislike the standard (pink, princess) girl's bike. Dimensions: 6.75" x 18.5" x 40.5"
Wished this bike came with a kickstand. My bike came and the pedals don't even fit to install. The only thing we wish it came with was a kickstand. For an 18" I'd have preferred it came with a basket instead of training wheels. Cute bike, she loves it. Our six year old loves her monster high bike. But "fork" for there not tire came bent and tire wouldn't go on, had to take to a bike shop since we didn't have enough time to return for another before her birthday. Please make sure that the brakes and the other parts are perfect. For the money great bike, and the 18" fits a 6 yr old perfect. Pedals are too big to fit in the holes and the handle bar too big to fit in the hole. Not only was it the perfect fit, the price was unbelievable. Everything on this bike fit perfect like a puzzle, nothing was backwards and I'd no problems what so ever with the brakes. My daughter is obsessed with monster high and this bike was perfect. My 5 year old (43" tall) just barely fits. She can handle bikes really well so it being a little tall for her is perfect. put it all together easy but only issue is that peddles that came out of the box didnt fit the bike... thought I was firting them wrong then went to a professional bike shop to fit them and anyways make sure breaks and everything is correct.. They look great & the basket will be perfect for collecting rocks & acorns. couldnt grasp how can the send wrong size peddles with a bike (that's the reason for the missing 5th star)..anyways I bought new peddles with correct size from the bike shop they're very standard and they fit perfect with no issues.. This bike exceeds quality expectations for the price. Also well made and not too hard to assemble. In between size was just what we needed as well. It's well made and surprisingly easy to put together with basic tools. The bike is built well and putting together wasn't all that bad. As good if not better quality than Huffy or Murray. Cute bike but the wrong size petals were in the box. For some reason, my child said it's hard to ride it. It was a birthday gift and the party was the next day so we'd to run to Target to get the right size. Pedals are too big to fit in the holes. Unfortunately, quality control was lacking because the bolts/threads on the pedals that arrived are too large to be screwed in. Can't ride a bike without pedals. pedals are too big for the holes, everything else seems to be fine. Not too tough to assemble, hand and pedal brakes, reflectors, decent bike. So that my daughter was able to keep her bike, I purchased universal bike pedals from Walmart that fit 1/2 in or 9/16 in. The pedals at Walmart cost me an extra $6. Was a little on the big side for my 5 yr old who learned to ride without pedals when she was 3. just needs to build more confidence. But a piece down where the pedals meet the frame (held to frame with ball bearings) bro 5 weeks in. Probably an odd occurrnce, as bike seems pretty good, and thus still gets 3 stars. 1st step has a warning Attachment of incorrect pedal into the crank arm will cause irreparable damage. the pedals don't enter the cranks but the price is good. I'm very unhappy as they can't provide tracking information to the replacement pedals and can't give me a status on them on 1-6-17. I gave this a 2 star because they gave 2 right pedals and it requires a left and a right. Cute bike, well made, and sturdy. Seemed cute but part that holds front wheel was bent and brakes were damaged, but packaging wasn't damaged so must be a manufacturing problem. Took 2 men pulling the front forks apart and another forcing the front wheel between to get it in. Forks didn't appear to be bent. 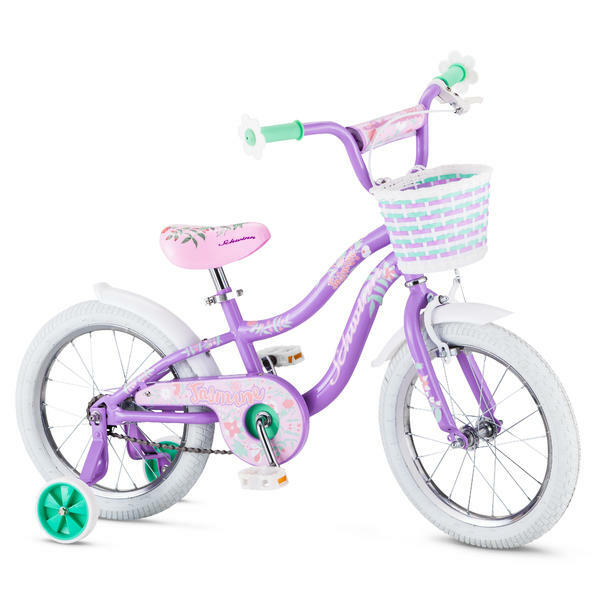 Initially saw it at Walmart two weeks before Christmas, fully assembled, 18" wheels, also had front wheel pegs and a little matching monster high bag on the front bar. Cute bike and assembly should have been simple...... however the front tire won't go on due to the fork being bent. We almost had to send it back because the front was bent. I'd to disassemble and re-align the front and rear brakes as they were bent in shipping. Manufacturing weld joint errors in the front forks. The bike also came with one flat wheel. Good bike, a spoke was bent on delivert, but i was able to fix itm. Update: new part came from mfg and didnt match the bike..... so exchanging this bike for a new one. This bike is easy to put together. Packaged well and assembly was very easy. Bike was perfect and easy to put together. Super easy to put together!!! Assembly was easy it only involves placing on the tires and tightening the handle bars. Easy to assemble, and all the parts came with it undamaged and correct. Got this for my 7yrs birthday and she loved all the fun stuff on the spokes and easy to put together. We were surprised at how easy it was to order a bicycle online and have it arrive promptly, in good condition and with all the parts. Granddaughter loves Monster High and is very happy with her bike, She's still not very sure about taking off the training wheels, but we're working on learning how to work hand brakes and she wants the Monster High streamers. So easy to put together...I put it together this past weekend, and she'll be getting it for her Birthday Party this coming weekend. It was easy for my husband to fix this(he's in the trades), but if it hadn't been for him, the bike would have been sent back. The part that holds front wheel is bent. bent rear wheel not enough time to replace before daughters bday. This bike was the perfect fit for our daughter. Awesome step up bike for my daughter. My daughter likes and it seems pretty solid. My daughter will be so happy to have this bike. 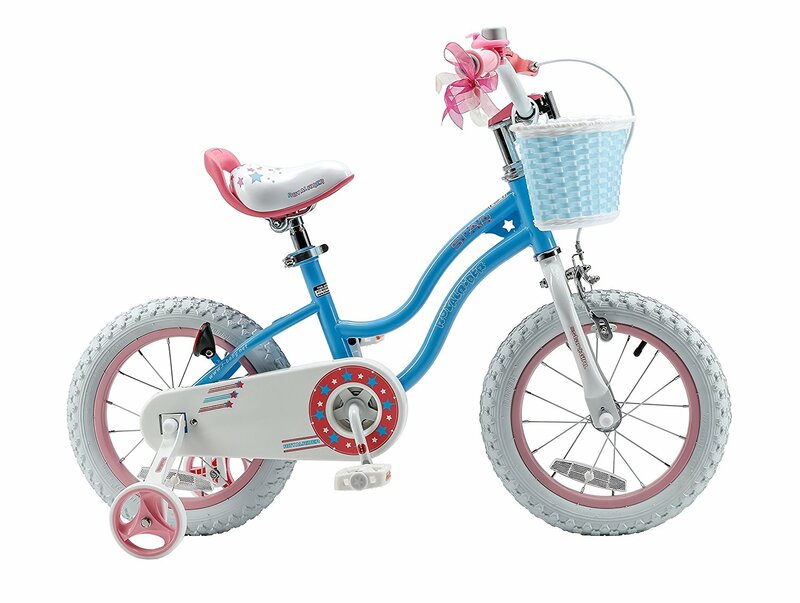 We ordered this for Christmas for my daughter, saw some negative reviews about bent wheels or missing pedals so we went ahead and assembled to verify everything was there before the big day. This bike is everything my daughter wanted and more. My daughter is happy with the bike and that's what counts. Great bike and kids love it. Great bike, daughter loves it!!. My daughter LOVES this bike. grand daughter loves this one. My daughter definitely loves it. Beautiful bike, my daughter loved it. My 7 year old daughter loves it.